Karen Corr was born on the 10th of November 1969 in Ballymoney, Northern Ireland and today is frequently known by the nickname: 'The Irish Invader'. She began her career in cue sports at the age of 14 and by 15, entered her first women's amateur event in Leicester, UK. At the age of 21 she won her first ladies World Snooker championship but although she continued her winning streak with additional world titles in 1991, 1995, and 1997, she soon found that in the ladies game, her winnings were not high enough to support herself financially which forced her to take on part-time jobs. In 1997 whilst on an exhibition tour in Australia with her friend and fellow player Julie Kelly, Julie told Karen about the US tour in which she was going to play and Karen decided to join her. Accordingly, Karen moved to the USA in 1998 where she began playing 9 ball pool. In fact after winning no less than 10 qualifying events in succession, she was invited to enter WPBA pro events. Karen won her first WPBA Classic Tour title, "The 2000 Cuetec Cues Players Championship" in Valley Forge, Pennsylvania. She completed that year with two more Classic tour titles. She also won the "All Japan Open Championship" held in Osaka, Japan. 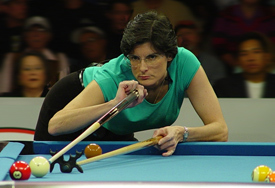 In 2001, Karen became the first person to succeed in winning all 6 WPBA Classic tour events since they began. She won the silver medal at the World Games and came 2nd at the World Championships. Before the end of 2001, Karen found herself at the top, the No. 1 ranked player in the World where she remained for the next two years. Karen continued her winning streak 2002 gaining three ranking events and placing in the top three in all other events helping her to maintain her #1 ranking. 2003 was also a great year in which she won the Joss North East 9 ball men's tour event. She is the only woman to win an event on the Joss Tour. She successfully defended her BCA event in May and succeeded in winning the US Open in Albuquerque, New Mexico and the Canadian Classic. In 2004, Karen won the BCA Championship for the third year in a row and went on to complete the year with a win in the Nationals in Oregon. Karen had a great year in 2006 with 3 WPBA wins and her first win in the Tournament of Champions. She was certainly one of the hottest players on the WPBA tour, winning the first event in North Carolina, a second place finish at the Viejas Casino in San Diego, a second win at the Florida Classic, and a third win at the Midwest Classic. In May 2007, Karen won The EnjoyPool.com championship. Then then won the New Jersey State Championship in July and has been a dominant force on the 2007 Joss Northeast Tour. In August, she finished 5th at the Turning Stone Classic IX in Verona, NY.